In New York City, we have veins of subway lines and bus routes that helps you get to where you’re going. While riding on the train or bus, you’re not thinking about the complex system, you are focused on where you have to get and if you’re running late. But, given the chance to freely choose a destination with no time constraints or obligations, your mind begins to see the complete picture of the subway system. Life is very much like this. While you’re in the grind, you are really not as aware of your situation. Yes, you know your alive, but in a way, you are sleeping. Completely unaware of what’s brewing under the surface. I find that it’s interesting I come to this point after Martin Luther King Jr. Day, since what he (and others) stood for and died for changed America forever. Strong words: truth to be self evident. Looking at the founding principles of what freedom is, it is built upon truth. An absolute truth. Truth was: all men were created equal. Not one was created higher than the other, we are all born babies–helpless. Now we have a growing culture where freedom is separated from truth. That there is no strong foundation where truth will set us free. Instead, we are living in a world where we openly say, “to each his own.” This is known as relativism. 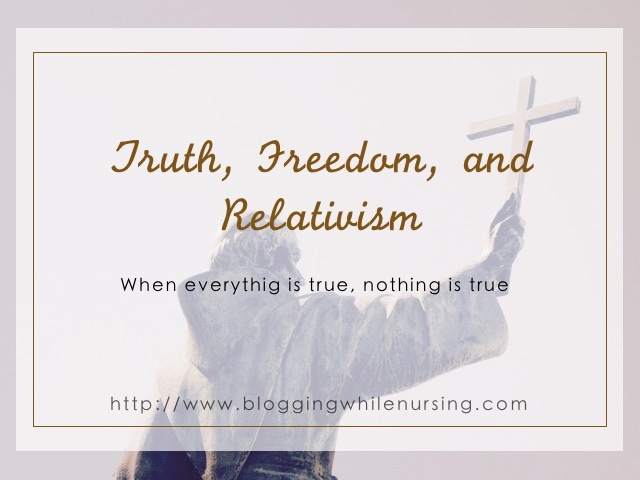 Why is relativism not such a great thing? Relativism changes the foundation for freedom. It is the principle that an individual can do what ever he or she pleases since there is no absolute good or wrong. When you do not agree with this way of thinking, you are seen as intolerant. As you know a person can believe in many things, not all of it is morally good. We lose sight of what is good for us and society and what is wrong. If everything is true, then nothing is true. It’s all a lie. Truth doesn’t change. What is wrong today, was wrong yesterday, and will be wrong tomorrow. Nothing will ever change that. Not our emotions, not how “society” feels about the issue. Truth doesn’t bend to will of people’s emotions. The way I like to see it is that truth has no emotion. As a society, it looks like we’re practicing relativism already, but we are not there yet. Today, we can talk about the horrors and wrongs of slavery, as well as the death of millions of slaughtered people during WW2. If relativism was truly practiced today, we wouldn’t see the wrongs in these two events in history, instead, we can see (and call out) the horrors that happened. If relativism was the rule of the day, both of these tragic events would have been (and in some areas remain) socially acceptable. Instead, we see the damage that humans can cause if we try to run on emotion and “logic” alone. We forget that what we feel should always be checked by an absolute truth. #Truth does not bend to the will of people’s emotions. The more we shift into a relativist society, then life would only be for the young and healthy. Once you’re sick or elderly, it would be more “humane” for society to euthanize you. A life is no longer sacred. to get rid of suffering, they get rid of the sufferer, but in the end, we still have death. My hope is we can step back and really see where we headed as a society and as a people. You know, take a look at the picture as a whole. My question to you is: are you sleeping? or are you aware of what’s going on? Do you prescribe to an “each his own” mentality? 1 Comment on "Truth, Freedom, and Relativism"